... There is not necessarily fire but sometimes steam! Like in this restaurant called "à toute vapeur" located near the Gare Saint Lazare in which ALL food is cooked in one of these giant ovens. I owe the idea of visiting this place to Serina, a visitor to PDP, who works for Goosta, a site dedicated to Paris restaurants - not yet in English ;~(. She says the food there is really good and healthy. I did not get the chance to taste it, but one thing I can tell you, it was not easy to come up with a nice photo! You mean nothing fried, nothing grilled, all a vapeur. What a concept! Actually, that was meant to be a question -- toute a vapeur?? And I think this a fine photo. But is it tasty? Eric you have a gift for finding both the beautiful and the unusual! Okay, just went to the link (thanks), and they mean it when they say toute. And apparently while eating healthful steamed food, you could also be logging on to PDP since they thoughtfully provide WIFi. And the price is right, too. Good tip, Eric! Viande ou poisson, ce qu'il y a dans le four ? Ou plutôt ce qu'il y a dans la méga cocotte-minute ? A priori pas vraiment appétissant mais certainement très sain et peut être même très bon ! Désolée mais trop tard pour l'anglais. I peeked at their site, and their menu looks pretty good! Better yet, it is not far away, so I will have to try it when I visit next. I like the photo! It does rather look like a washing machine though! Hmm. It doesn't smack of the famed and adored cuisine a la Paree to me, though. Gone is the saute, the fricasee, the roti, the wonderfully handsome French chef toiling over flames in order to lovingly set our mouths on fire with a suffusion of flavours. Phew! In other words; no it's not doing it for me. Oh and Eric? Pic of a handsome French chef please! That seems interesting, actually something I might want to try. I was skeptical at first, but the menu looks yummy. But you know, there is nothing like a fire-roasted piece of meat!! A number of us overseas have been worried about the rising Euro. Then yesterday many of us got news here at PDP about the stock market tumble. But today you have shown us that it is still possible to find healthy, gastronomic adventures in Paris even with our relatively emaciated wallets and pocketbooks. tall gary -- called the Grand Vefour recently. Have been there twice and loved it, so wanted to arrange a meal for honeymooning friends. Practically passed out when they told me what it would cost (and this was for lunch, not even dinner). They may have lost a star, but not their chutzpah! 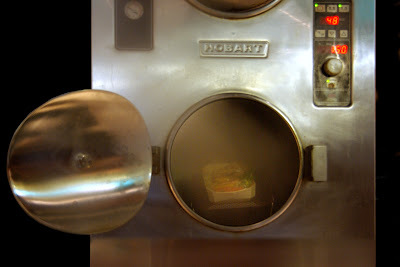 I too will be dining on steamy food when next in Paris. Hey, do I get a prize for having last and first? Some yummy steamed treat perhaps? Wow, when I first looked at the photo I thought you were at a laundromat, Eric. Well, there's a concept...wash the clothes and get a steamed plate of food, too. Okay, that really is a horrible idea. I'm with Christie and the "fire-roasted piece of meat!!" I think when you go to Paris you should have at least one meal at some place truly fantastic like le Grand Vefour if you can. After that, though, A Toute Vapeur looks like the spot for me. Steamed food is nutritious and tasty. Naturally, here in Australia, one simply uses the dishwasher, sans détergent !! A pleasant change from a BBQ. We just use a steel basket insert in a covered saucepan here. I usually steam all my vegetables with that. Fish fillet poached in wine and herbs in a covered skillet, and it's dinner. I think Californians got the idea from the Japanese. Good stuff! Alexa, I suppose I could do worse than le Grand Vefour as one of those fantastic one-off experiences recommended by Petrea. I believe La Tour d'Argent lost a star (now 2), yet, Google seems rather insistent on maintaining three stars for le Grand Vefour. Sounds delicious U.S. Elaine. Think I'll check out local herb availability and see what I can do. "Poached in wine." Woo woo. At first glance, I thought it was a package of cigarettes in an incinerator. I just had a slice of pizza so nothing sounds appetizing right now. I'm with Lynn, where is the handsome Chef? USelaine, that's what we're having tonight! Got a piece of grouper at the farmers market today. It's poaching as we speak. Cool photo! Or should I say steamy photo? Looks like something from a sci-fi movie! I'll definitely check out this restaurant when I'm next there, especially since they have wifi so I can keep up on PDP goings-on. (Thanks Alexa for that tid-bit!) FYI, I did some research and Hobart is an American company founded in 1897, headquartered in Ohio. My favorite bit of trivia is that in 1906 they build the Model 212 Peanut Butter Machine! tall gary -- there was an article in the March 3 edition of the Intl. Herald Trib. Just google "grand vefour loses star" and it's the 1st thing that comes up. Whatever -- I'd still like to go back, the gazillion-euro price tag notwithstanding. BTW, last time I ate there, we were given Napolean and Josephine's "usual table." I'm with Lynn and Lois -- handsome chef pic, please. Oh, but didn't Eric say he doesn't usually take pix of people? Some liability issue or something -- can't quite remember. Thanks for the heads up Alexa (as if I need to bump my head more than I do). I got my information here which looked to be dated June 7, 2008. But still I was wondering because this guy seemed to have been less than three-starred tickled with the food. Zoot alors! Nappy and Joe's regular table. Did he carve their initials inside a heart? L & L's desire for the sight of some young meat brought to mind this butcher shop. I hate to betray my age but all three of the guys look too young to be believed. Yep Carrie, I think Tall Gary gets the laugh of the day award. Nappy & Joe is now mentally carved on a virtual index card for that next cocktail party. So Eric, PLEASE tell us that they offered you at least a taste. Otherwise, your fans will be steaming! I agree with you Lynn, French cuisine sounds much better to me. However, you'll have to look long and hard to find a Frenchman in the cuisine these days. Well, with all this talk of cemeteries and funerals lately I thought maybe Eric had visited a new crematorium or something! It appears to be a "Steam-a-torium" for food?!! I love steamed veggies and short grain brown rice and all, "California" style, but "Steamed Meat"?? Non, non, non! Give me a bavette covered in sauce anyday! Bon Week-End all...it's been a wild week!! I clicked on T Gary's link, and am reminded I am such a newb. Thanks for overlooking all my faux pas. Not for nothing my avatar blushes. Really, Michael? Are the French chefs all women now? tall gary -- thanks for the great linkage. How did you know about the N (heart) J carved in the table? Was it the absolute best meal of my life? No (it was fabulous, just not the best), but I agree with that guy about the service: Those waiters have friendly yet obsequious down to a science! tonton -- steam-a-torium? Very funny! Tall Gary, L & L -- funny! I remember that photo of the butcher shop. Yes, two of those men are very young -- my daughter's age I would say. All the chef's I met in Paris were men and they were French. On the other hand, here in San Francisco, many French restaurants have Chinese or Mexican chefs. Alexa: I wonder what a dendrochronologist would have to say about the age of that table. Just wondering. How did I know about the carving? I didn't. I, too, chortled at tonton's "steam-a-torium." USElaine: Eight dollars a bottle? And I just now poured into a heating saucepan my last bottle of 1978 Domaine de la Romanée-Conti Montrachet. Just joking, obviously. Trader Joe's is more in my league. T Gary - I am sooo coming over to your place for dinner. What? Oh, right, me too. I'm very glad to add 'goosta.com' to my 'Favoris' sites (Thx Eric, as always)! I easily can trust Serina that steamed food in 'à toutes vapeurs' is good. I love many types of foods : dietetics ones and less ones, if the quality is here!!! Miam miam... I am already hungry and it is only 11.15 am! Bon dimanche, régalez-vous tous avec de bons petits plats (cuits à la vapeur ou non) et à votre santé! Okay Lynn, does this chef have to have a big chopper? can't believe you didn't have a taste! My mouth is drooling from all the way over here in Australia! I'm curious about the taste of the food they make...to use only this way to cook is strange. But I'm sure it's good. Petrea, I think Michael wanted to say that Frenchmen were rare today in the kitchens, replaced by Foreign-men, not by women! Ooh, tall gary -- more good links (and very funny). Good thing it wasn't the 1990 Romanee-Conti Romanee-Conti at $18,000 a bottle! Personally, I keep a box of Chateau Cardboard 19 o'clock in my fridge -- surprisingly not horrible, lasts a looong time, and the little spout is so handy. Alexa...you're right. In 2001, a lot of seven of the 1978 Romanee-Conti sold for $167,500, making it the most expensive (drinkable) wine ever sold in America. However, the world's most expensive (nondrinkable) wine is still a Bordeux, a 1787 Chateau Lafitte with "Th. J" (Thomas Jefferson) etched into the glass. Yeah, Jefferson had expensive tastes, eh? BTW, for you enophiles out there, it is unusual for even the best of wines to last more than 50 years before they become undrinkable. LOL Anonyme ! I just daren't even answer. Er... no i suppose. Not necessarily. Oh, now you guys have got me thinking of the best wine surprise I ever had, a Mt. Helena (CA) 1979 cab that I can still taste and which, if anyone has any squirreled away in the cellar, please contact me if you'll let a bottle go. We took it on a hike and enjoyed it with a picnic in the woods. Magical. Eric, What a great photo! So industrial looking. Gives a feel of Nighthawks at the Diner meets the Jetsons. There is something "automat" about it. Perhaps because there is no human in the shot, and "bing," out pops your food. Fun to see it! The steamed dish inside is the same one used to make the delicious curried fish and veggie souffle thing the Thai restaurant up the road makes. I'm with US Elaine, a little poached fish and steamed veggies is a staple of life at our house. But I'm voting we all go over to Alice's today. Did you SEE what's on the grill for lunch!? And Bergson is bringing some lovely strawberries to make ice cream. Yum! Oh, Lynn, there is a television chef who picks up women at the market, buys groceries, takes them home and cooks dinner for them. Have you seen that? And, another chef you might know from TV, Anthony Bourdain, is making an appearance in Seattle this weekend and creating quite a stir. Oh Kim, I'm envious! Anthony Bourdain's book "Kitchen Confidential" was so entertaining and eye-opening, that I followed his television show for a long time. Travel, expertise in food, and most of all, attitude. Great photo/place,Eric. At first I thought you would show us a public laundry today (maybe an idea for future posts ?). I would love to have this place in my neighbourhood. The food looks so appetizing and healthy. But Guille's right;it does seem like a strange way to cook everything. I'll see if I have time to go there in July, when I'm in Paris again. Personally, I think this looks like a high-tech ad for Hooters. No Kim! I've seen tv chef Jamie Oliver do this in an advert but that's all. Mind you, it doesn't appeal to me particularly; if a chef's going to pick me up and treat me to a gourmet meal, i'm damned sure i'd want to be in a lovely restaurant not my own kitchen with my undies drying in the background! Alexa, Do you know the story behind the N (heart) J carved in the table? I'm listening. "I keep a box of Chateau Cardboard 19 o'clock in my fridge -- surprisingly not horrible, lasts a looong time, and the little spout is so handy." You're funny. I could not have said it any better. I buy that wine too. I think it is very good. Years before this invention, I had to return bottled wine many, many times as it had gone bad. As Coltrane said, "it is unusual for even the best of wines to last more than 50 years before they become undrinkable." Years ago here in San Francisco when they were excavating for the building of the Pyramid Building, they found many ships that had been buried by landfill during the Gold Rush. In the hull of one of the ships they found a lot of Champagne that had NOT been opened. Not drinkable of course, however, a great piece of memorabilia. I agree with Lynn. It is so much better if the chef is cooking for you at his own restaurant. That happened to me only once. Although, I did have one boyfriend who use to cook for me at home. He was great. Then when we got married, he stopped :( What's up with that? I have been on a marathon lately working on a dozen or so paintings all at once -- painting from noon until 10 pm at night. I plan to continue at this pace for a while. So back to work. Lois -- oh dear. what a shame to waste good Champagne!